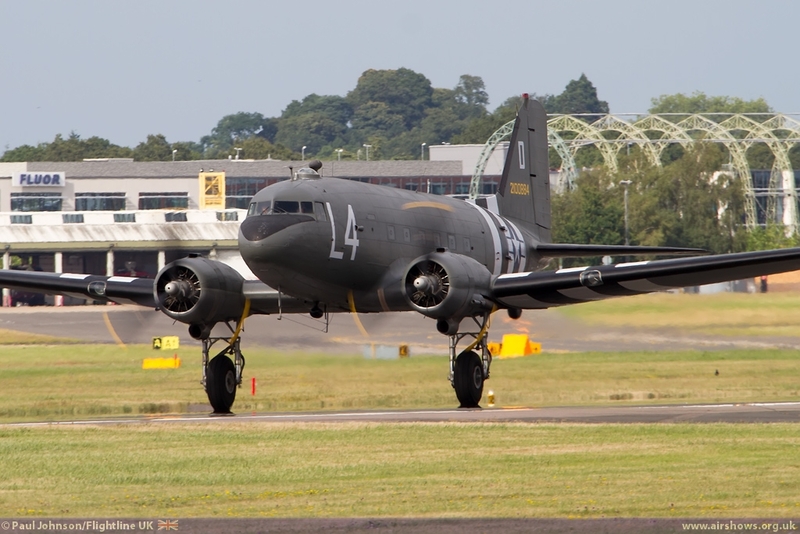 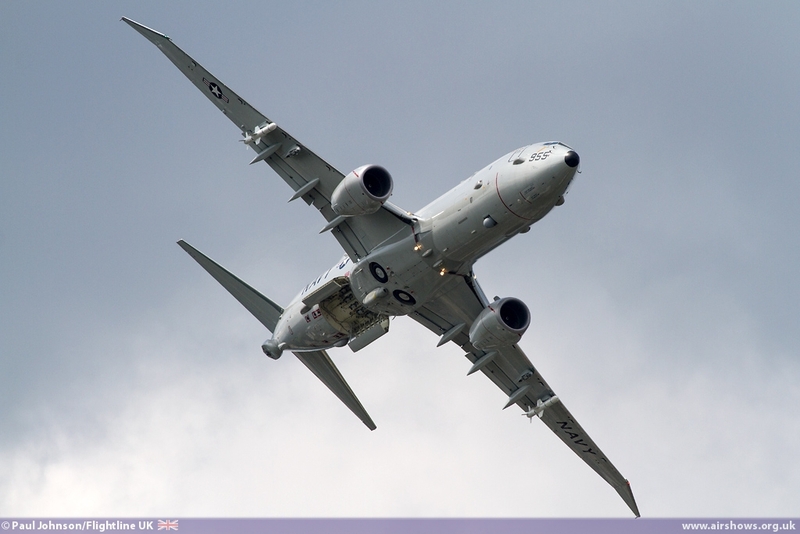 In the second of two reports from Farnborough, Flightline UK looks at what was on offer during the public shows at the weekend. 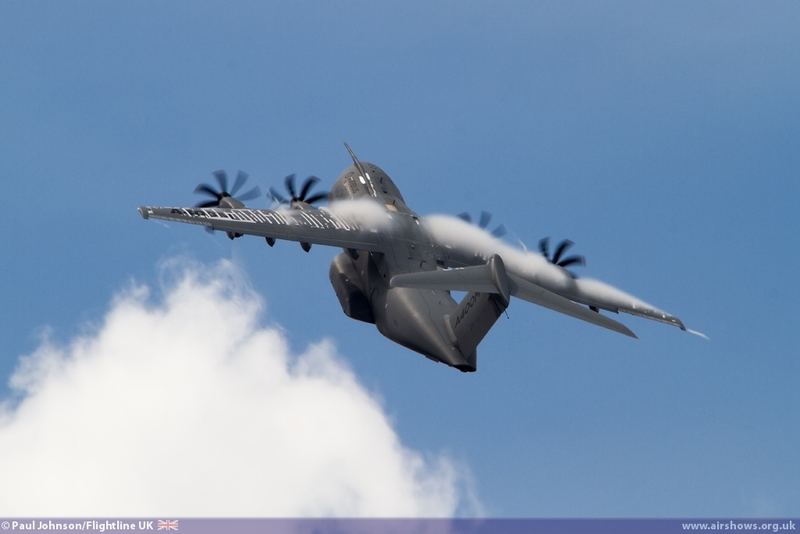 Recent years have seen some big changes in the way aerospace companies and manufacturers have participated at Farnborough. 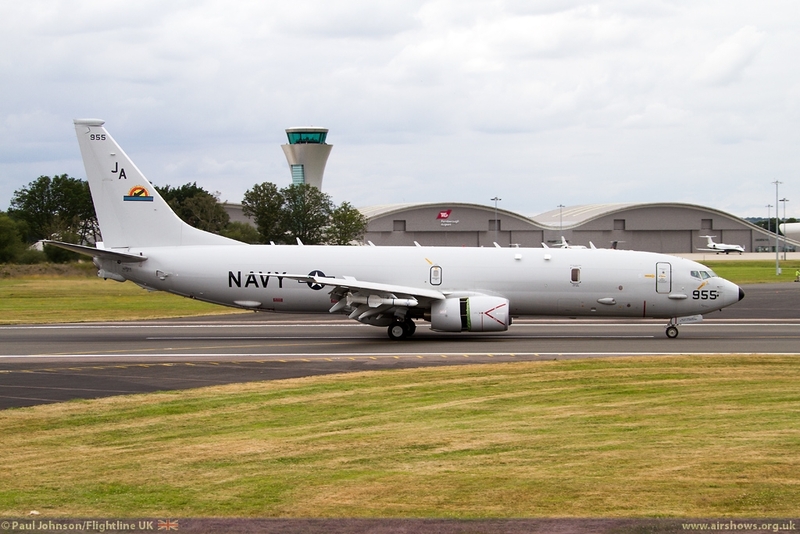 In these financial strained times, companies can often spare the time or money to commit to a full seven days at Farnborough for their personnel and aircraft. 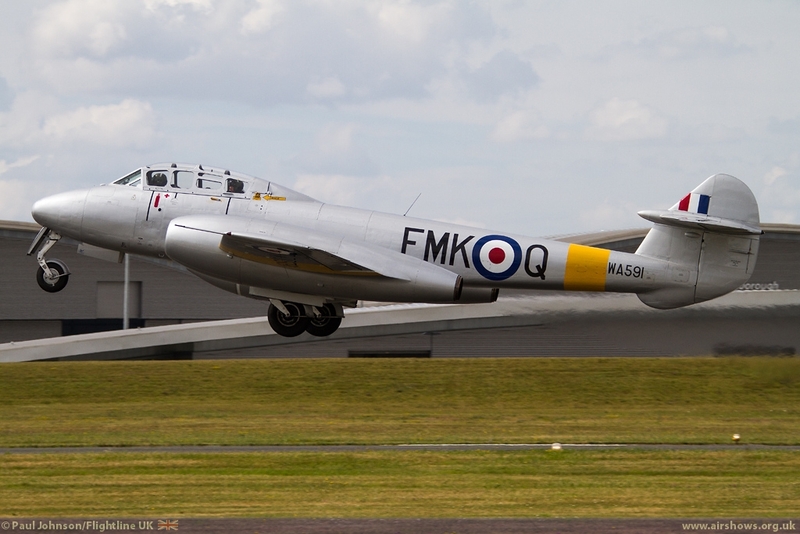 That has often meant some disappointment for the public at the weekend with some of the more interesting aircraft failing to be on show, and exhibition stands left empty. 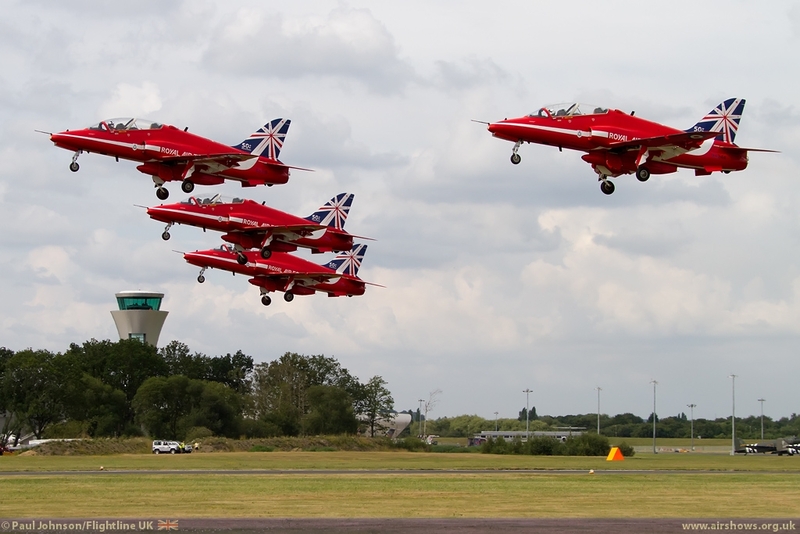 In 2014, Farnborough re-launched the public weekend offering new and exciting ground shows plus an enhanced flying programme. 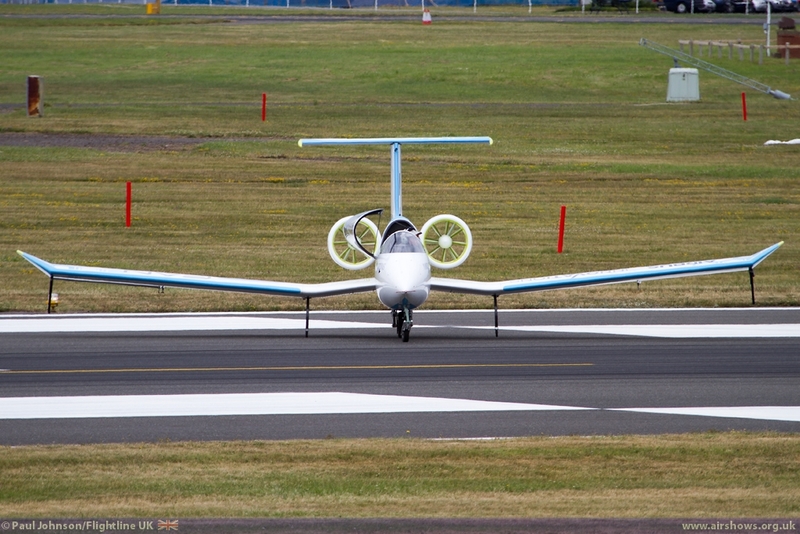 The new public weekend concept for Farnborough is certainly an interesting development. 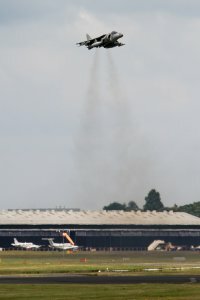 The public airshow had its own unique branding separate from the more corporate style of the trade week and even its own separate Souvenir Programme. 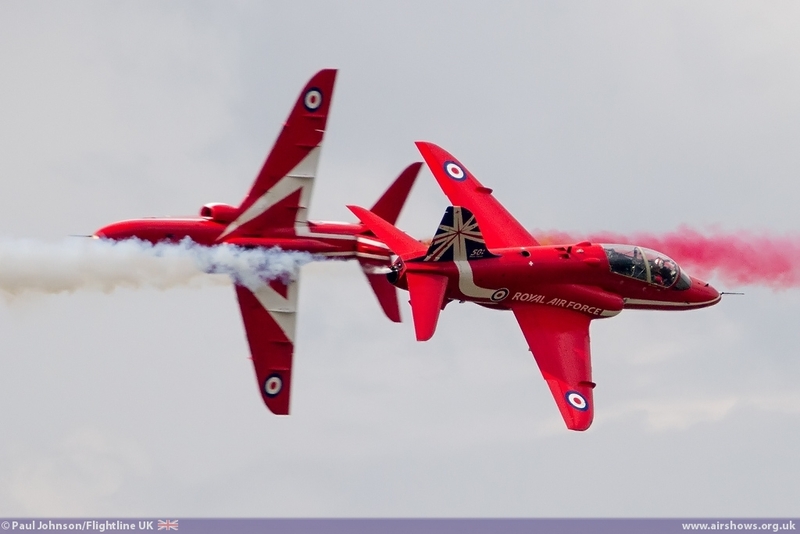 Though, as in recent years, the bulk of the exhibition halls remained closed, the team behind the public weekend had certainly worked on the ground show. 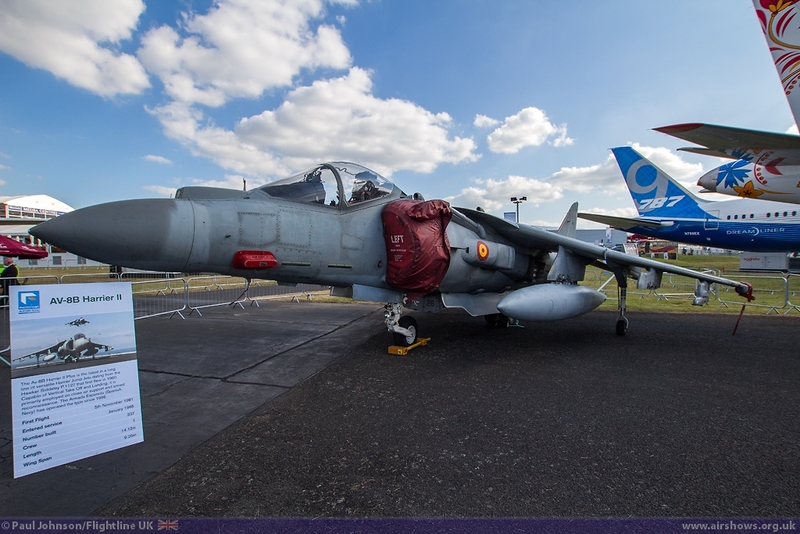 Some exhibition halls did remain open to showcase the "Space" and "Futures" displays though these were in the upper halls. 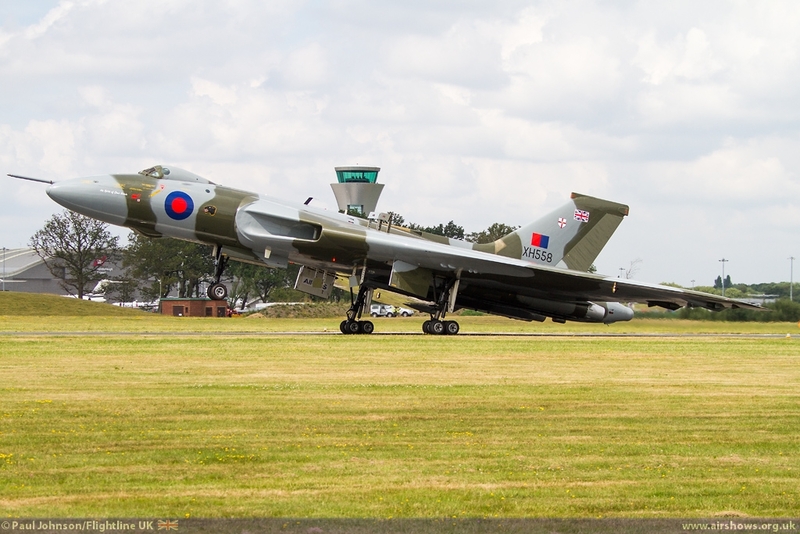 It would be better if these were much nearer the main showground as more people would undoubtedly visit them! 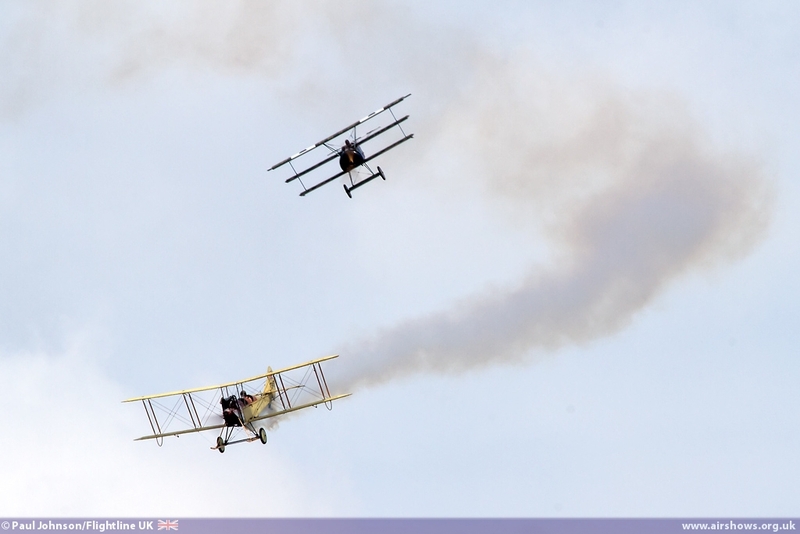 Vintage aircraft were also displayed on the ground as part of the event's main theme of "100 years of Aviation." 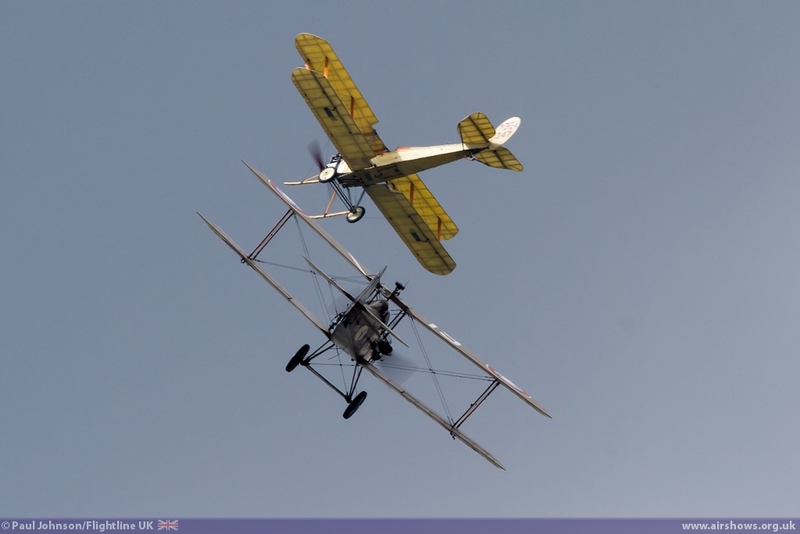 The likes of the a Wright Flyer replica, the Brooklands Museum Sopwith Camel, Blackburn B2 and Cirrus Moth were exhibited on the ground in a special cover exhibition space and the "Labyrinth of Invention" was opened near to the Airbus exhibition. 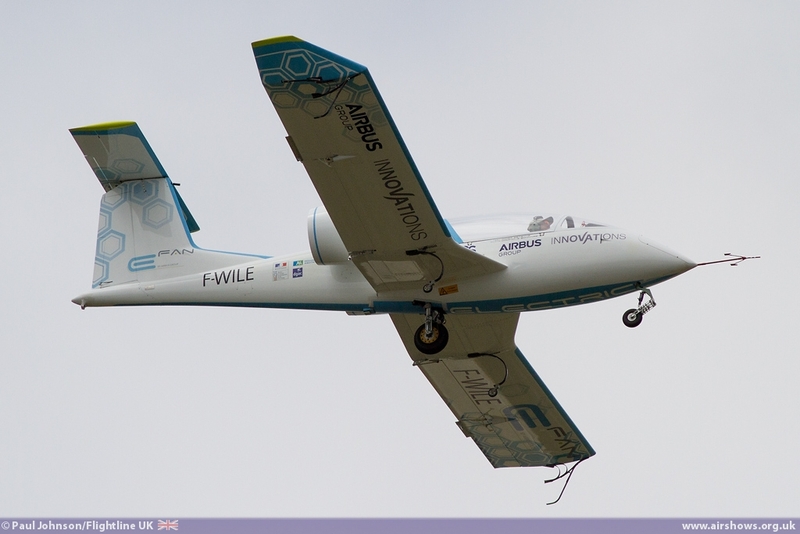 New for 2014 was the Farnborough LIVE stage along with several large screens around the showground. 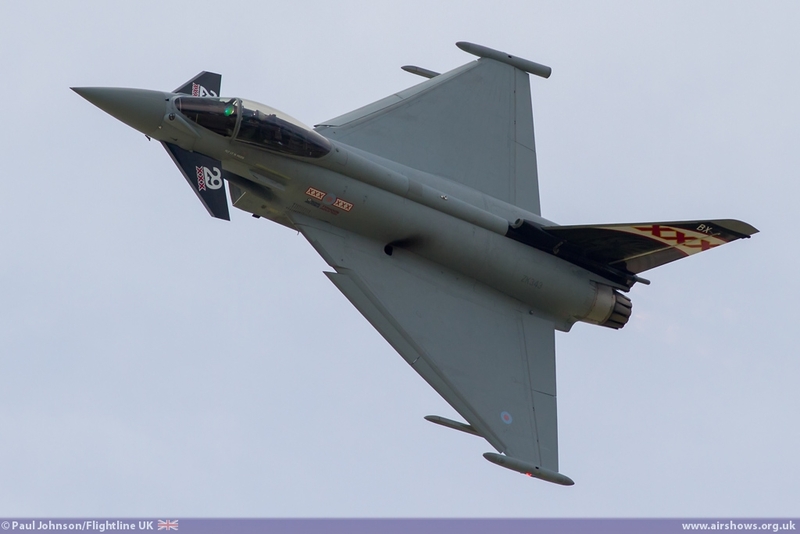 Like the RAF On Air concept at Waddington, the stage was used to showcase many aspects of the show including exhibitors and the various air displays of the weekend presented by Angelica Bell from BBC's One Show and Michael Underwood. 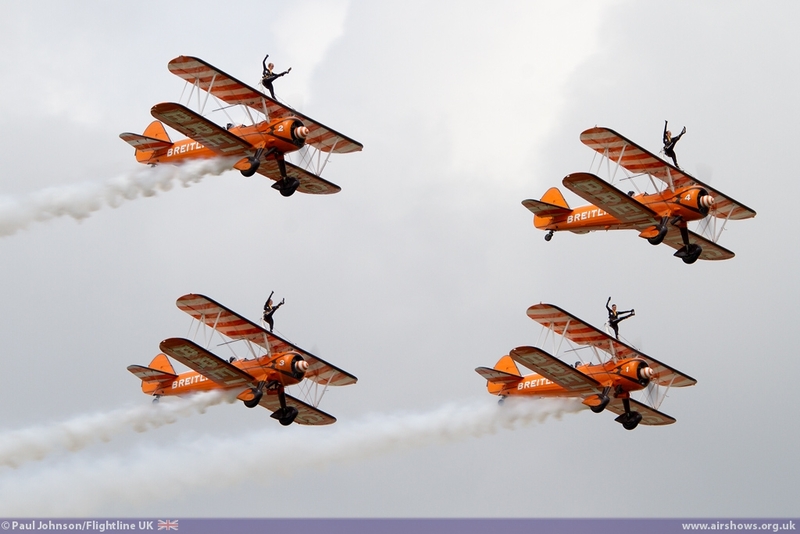 However, many things remained the same including the main airshow commentary by Stratton Richey. 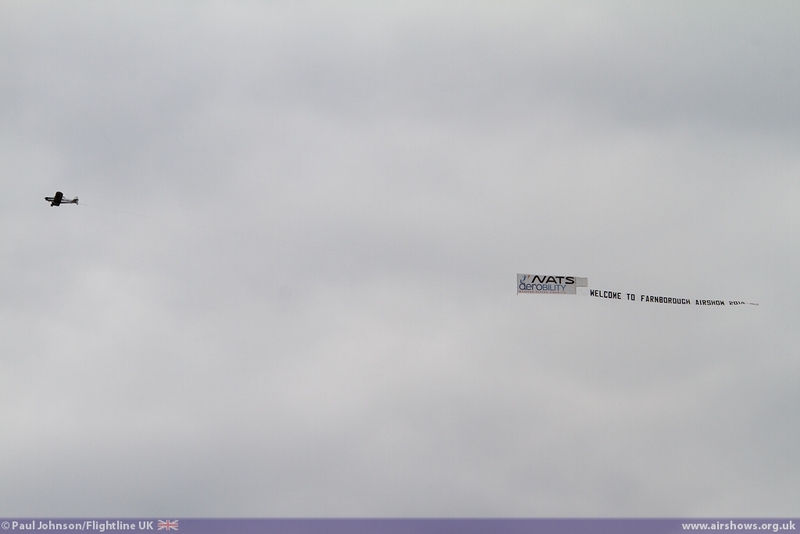 On the ground, the static park changed considerably from the trade week. 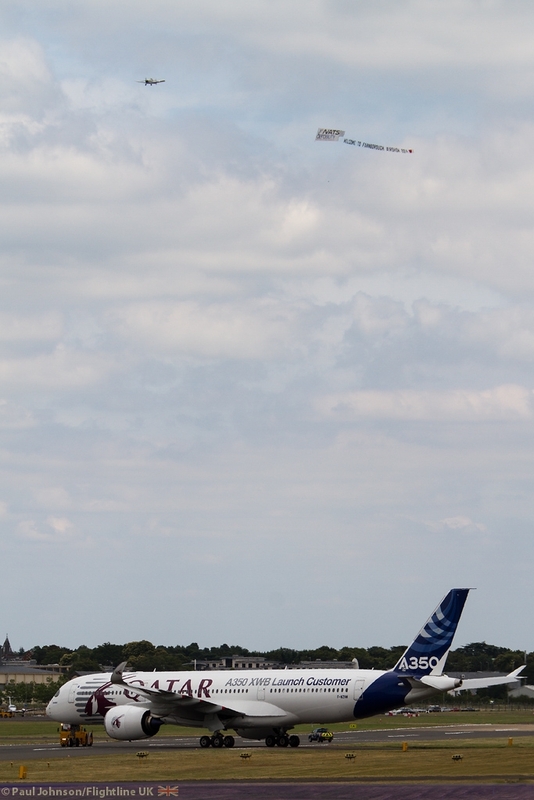 Gone were several of the gleaming business jets and some of the Airbus line-up. 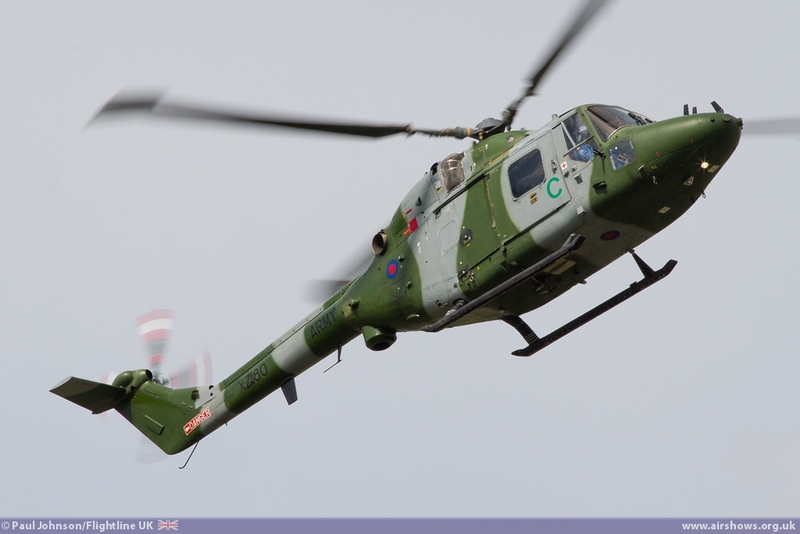 In their place came a static Royal Navy Merlin HM2 and a handful of historic aircraft right at the western end of the showground including the newly repainted Hunter PR11 plus the Gnat Display Team's Yellowjack Gnat T1. 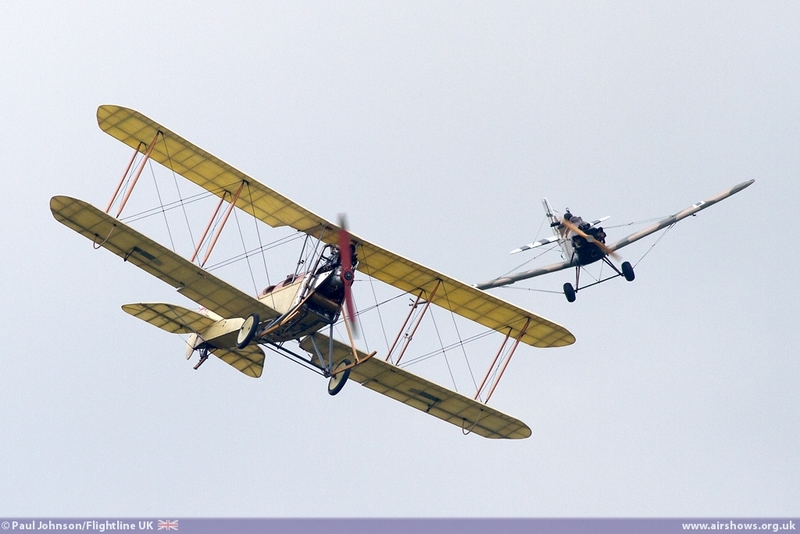 The biggest change in the flying display however. 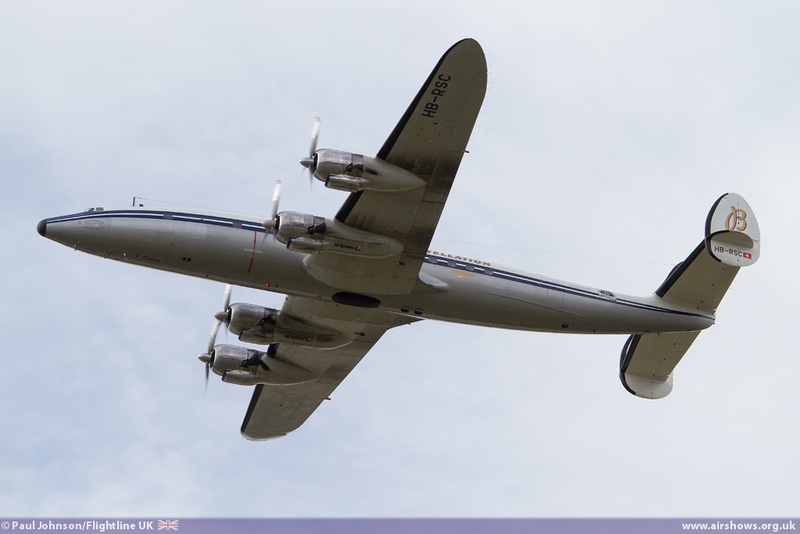 Boosted to a five hour programme, some of the best of the trade week displays stayed on to entertain the huge crowds, but Farnborough also added a very wide selection of historic and modern displays to highlight a centenary of flight. 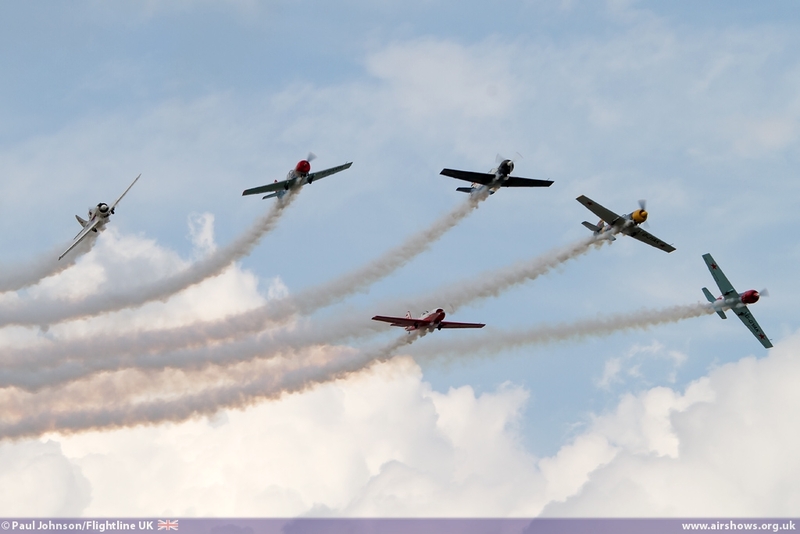 Another civilian team that certainly grabbed the attention of the crowd were the Aerostars with their six Yakovlev Yak-50s. 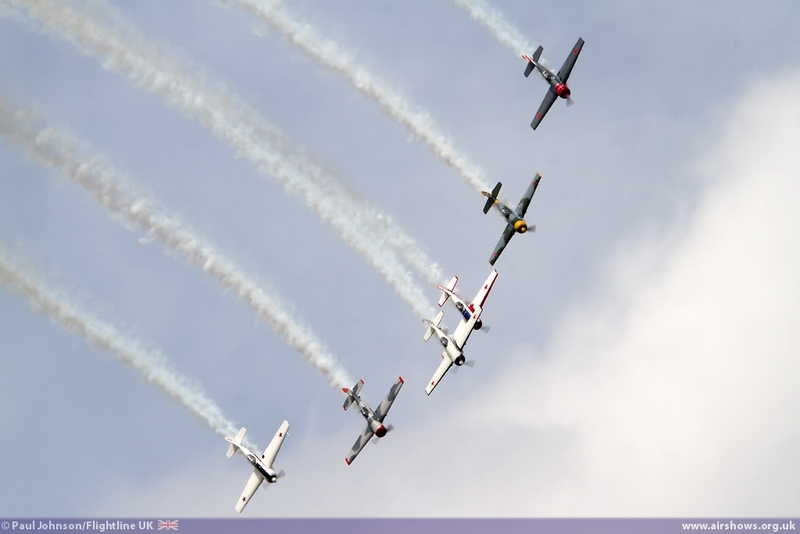 The Yak has great presence and the Aerostars certainly put in one of the best formation displays you'll see anywhere. 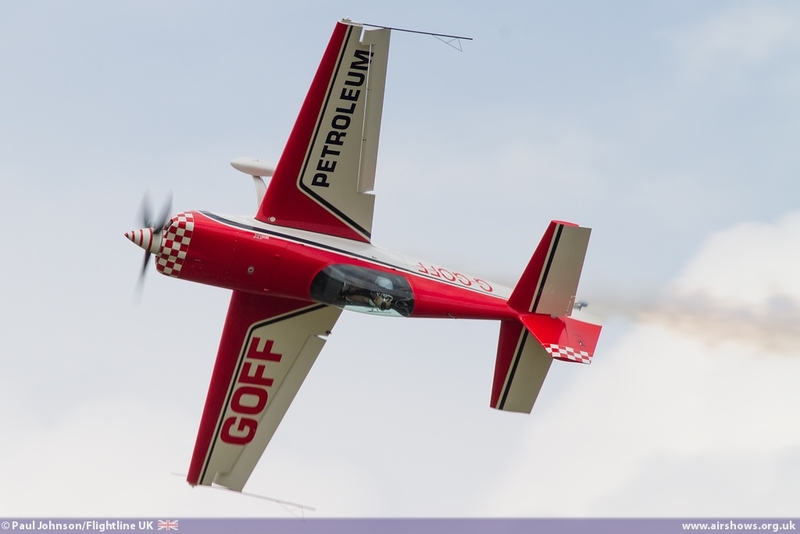 Solo unlimited aerobatics came from Mark Jefferies in the new Extra 330LX sponsored by GOFF Petroleum. 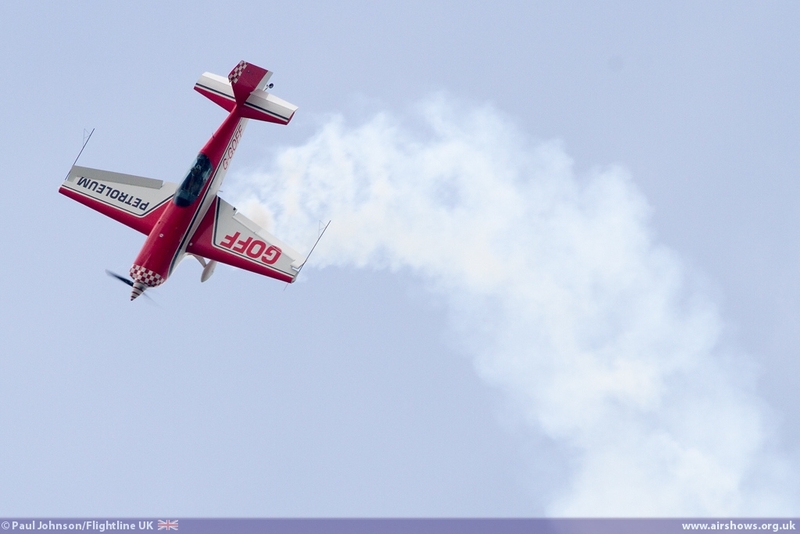 Mark's displays are always a bewildering mix of loops, rolls and tumbles complimented by great use of smoke - it is not hard to see why he gets to display around the world! 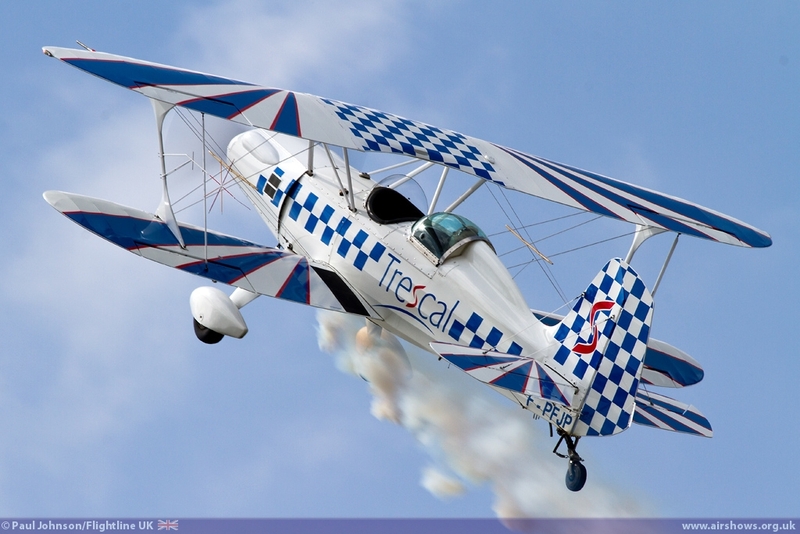 A much more classical aerobatic display came from the Starduster Too flown to represent show sponsors and exhibitors, Trescal. 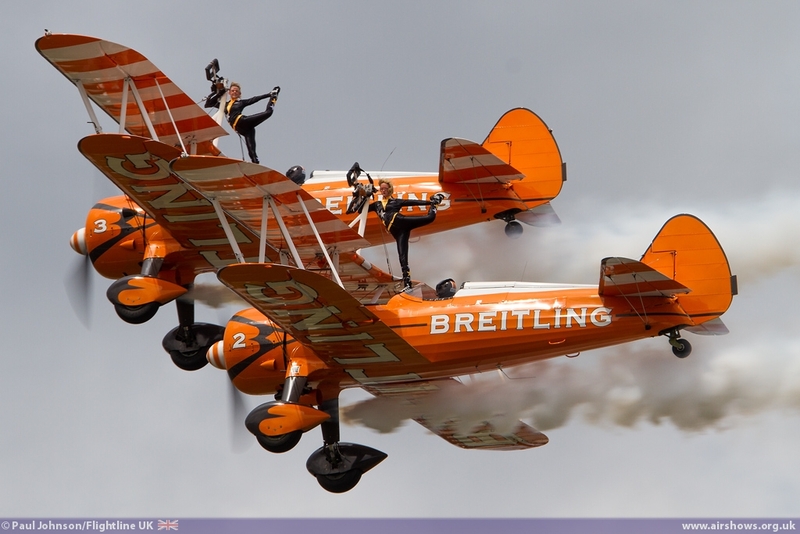 Completing the line-up of civilian teams were the Breitling Wingwalkers with their rare four-ship display. 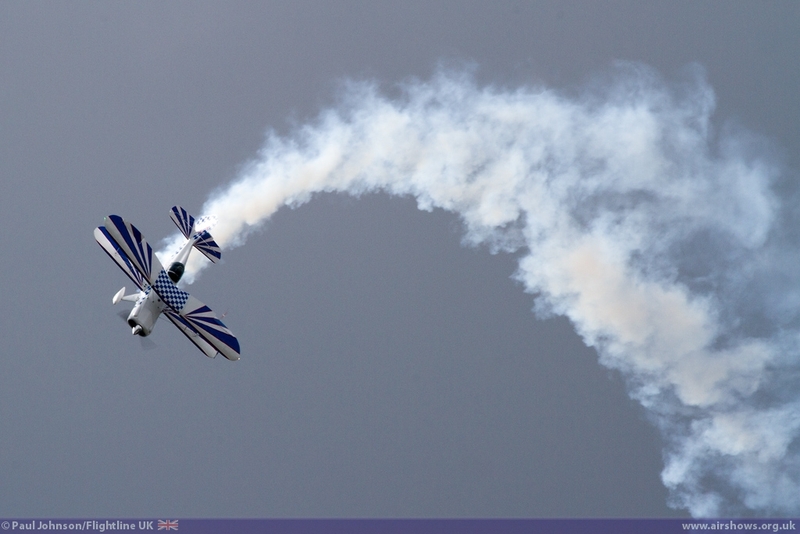 The Farnborough certainly enjoyed their display which always kept action in front of the crowd. 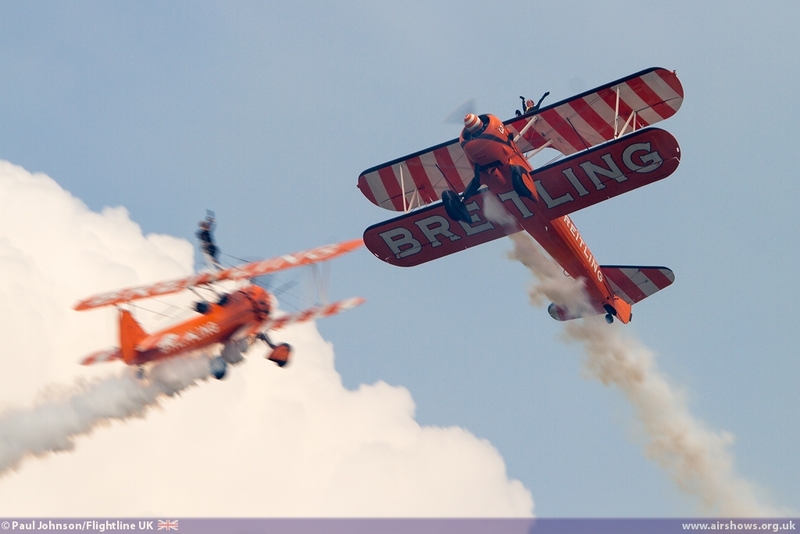 Indeed they were voted in the top five of favourite displays by Farnborough's Facebook followers. 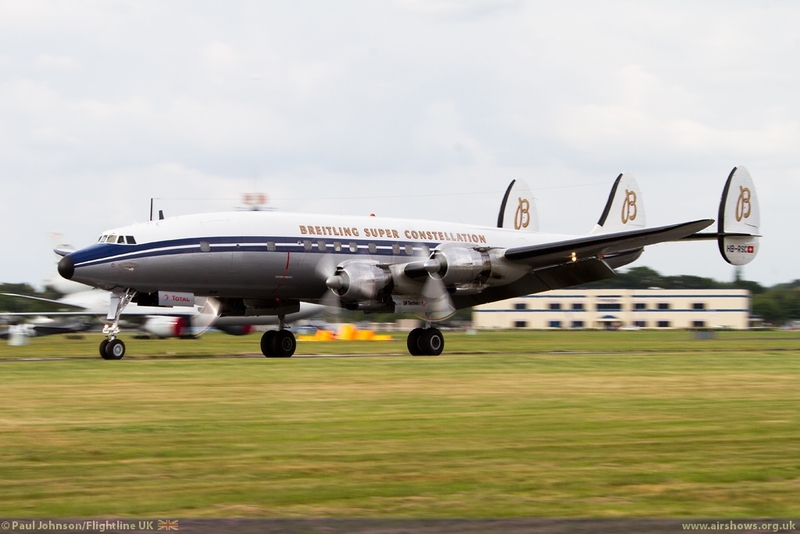 Breitling also sent their wonderful Lockheed Super Constellation to take part in the flying display. 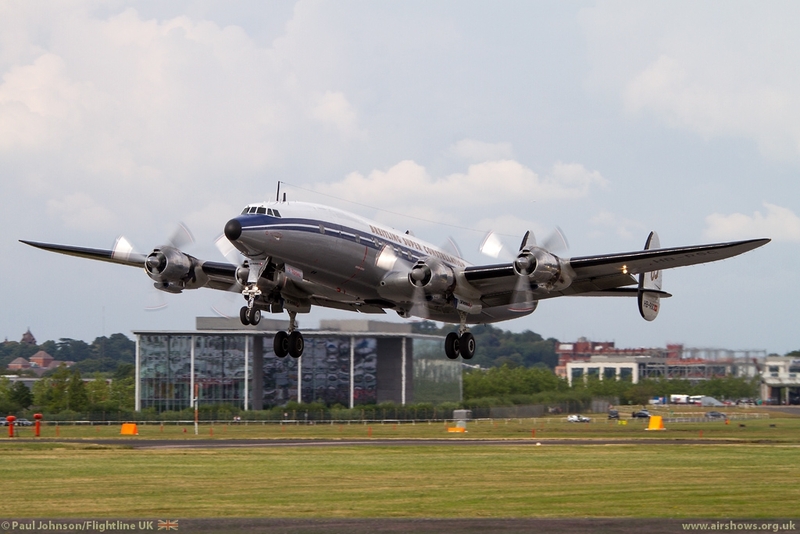 The large and very beautiful 1950's prop-liner gave a very gentle display of flypasts but its rariety value meant that it was one of the real highlights of the weekend flying displays. 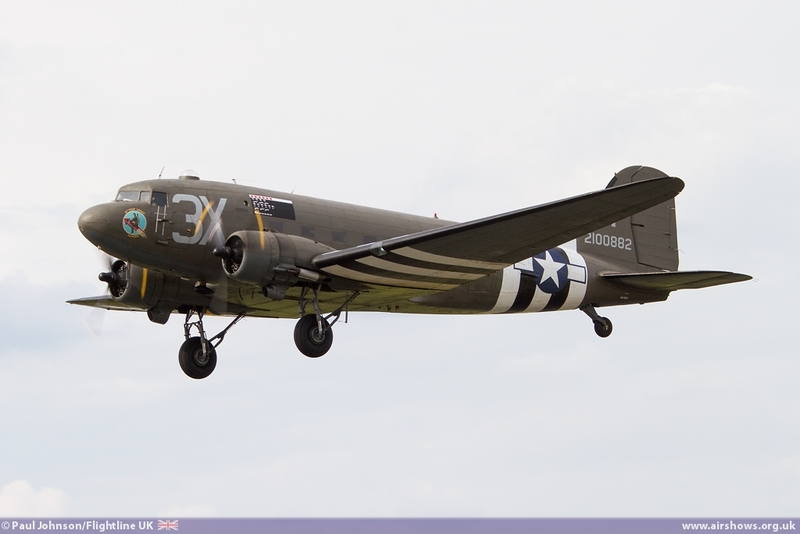 Later in the day, no less than three C-47A Skytrains performed a graceful formation routine to mark the 70th Anniversary of the D-Day Landings. 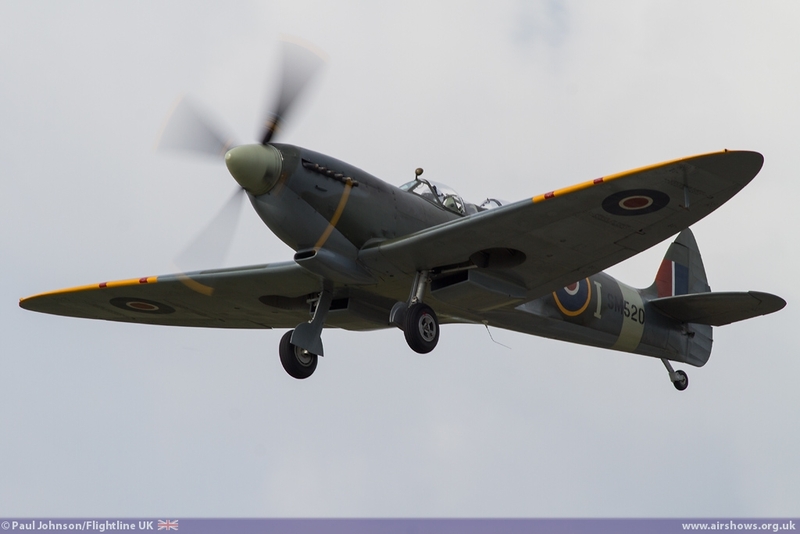 Historic military piston power displays were also in evidence. 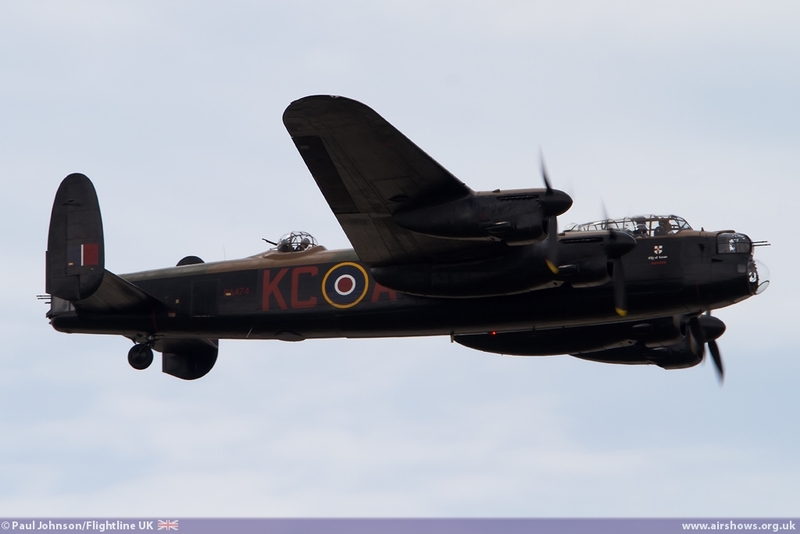 The Battle of Britain Memorial Flight Avro Lancaster made an all-too brief appearance during Sunday's flying display with a single flypast - perhaps a sign the BBMF are incredibly busy this year and were unable to fit in a proper validation stop in the week before the show. 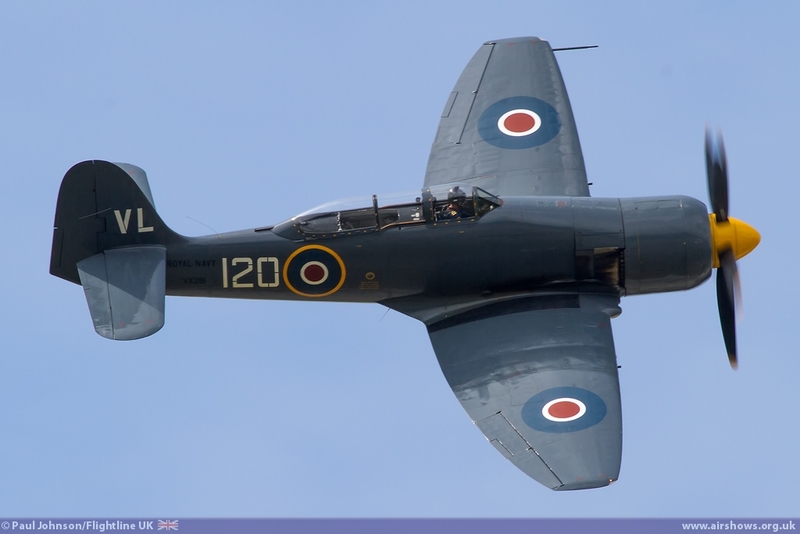 The Royal Navy Historic Flight did however put in a full display with the Hawker Sea Fury T20 flown by Lt Cdr Chris Gotke operating from RNAS Yeovilton. 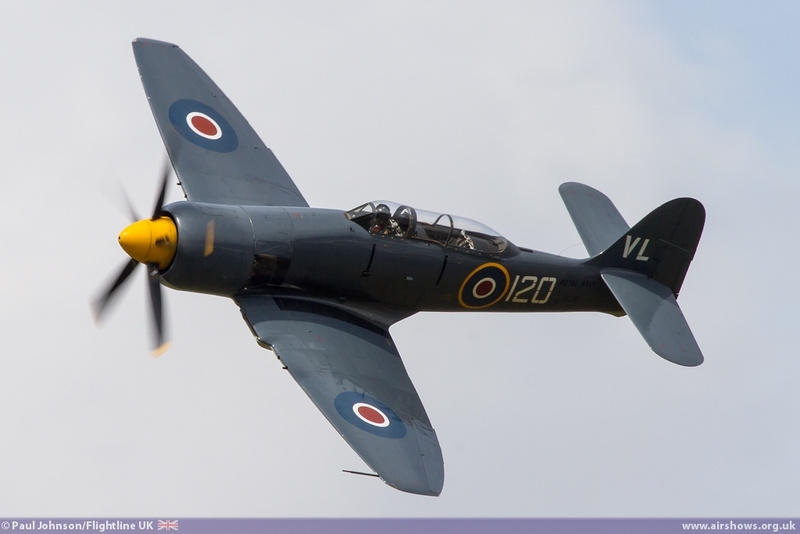 It is great to see the Sea Fury back on the circuit after a problematic few months for the Flight with various snags and paperwork issues to overcome. 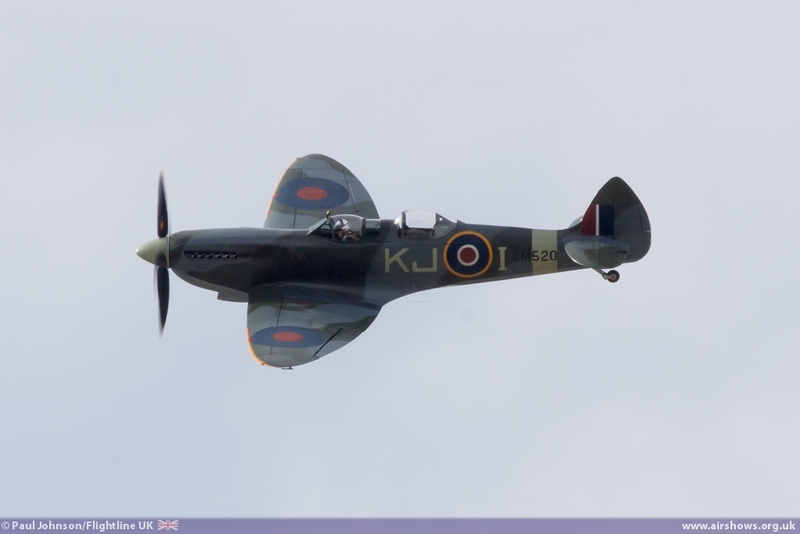 The only Spitfire in the 2014 show came via Rolls Royce. 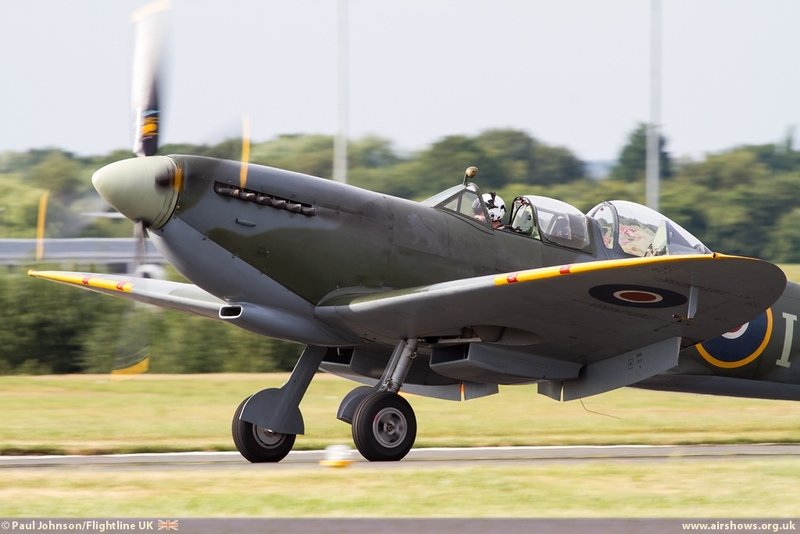 With the company's own Spitfire PRXIX out of action, the two seat Spitfire IXT SM520 was borrowed for Farnborough and provided a fitting finale to the week closing Sunday's show. 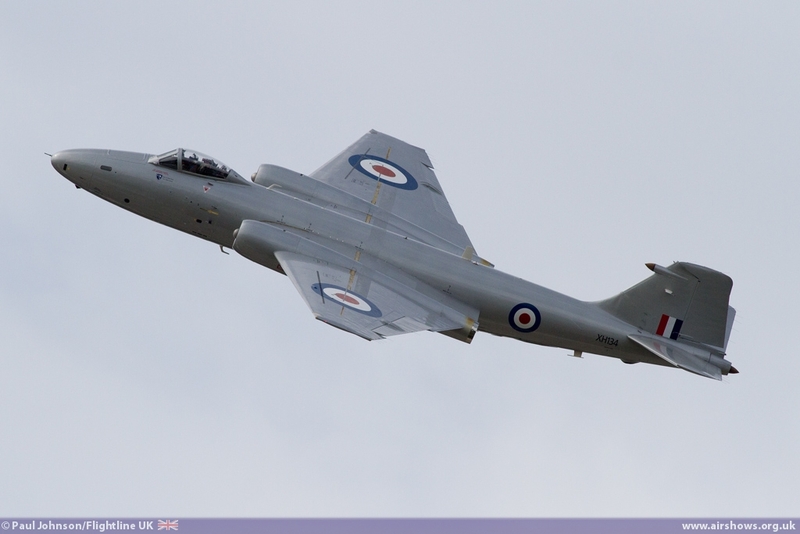 Classic Jets certainly had a good showing in the flying displays. 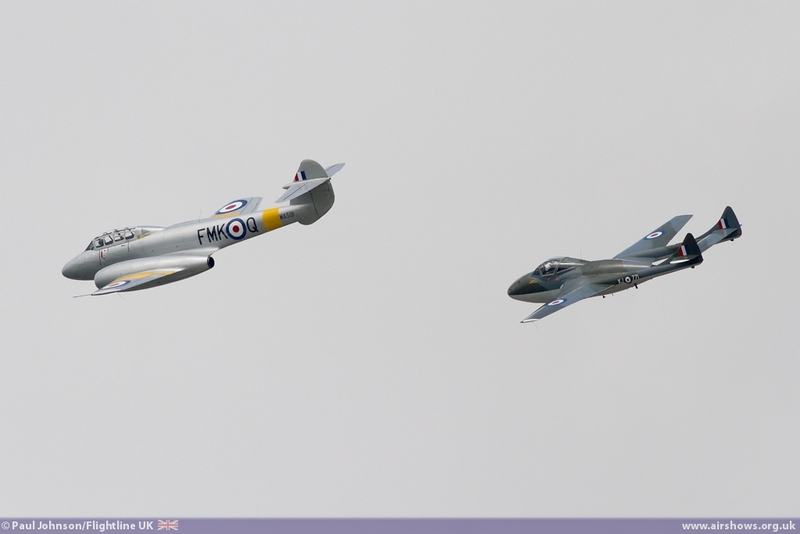 The Classic Air Force sent their wonderful pairing of Gloster Meteor T7 and de Havilland Vampire T55 which was very reminiscent of the "Vintage Pair" display team mounted by the RAF in the 1970's and 80's. 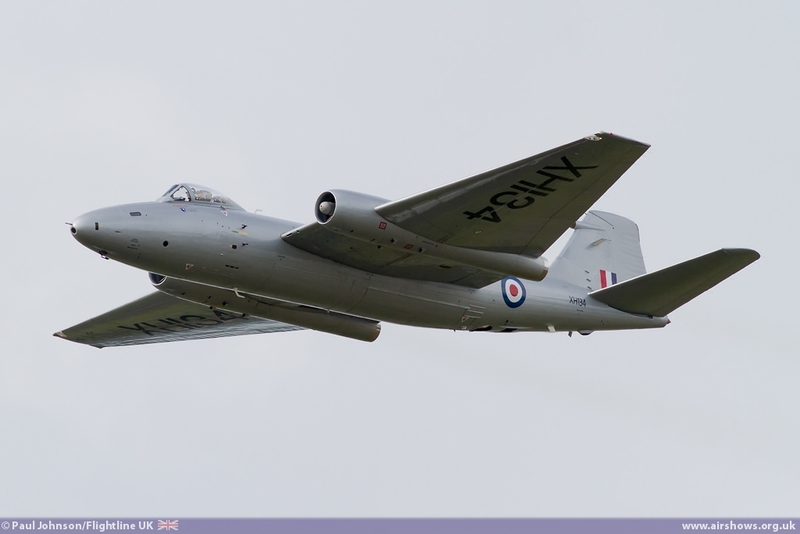 The Meteor and Vampire were also types synonymous with the golden age of Farnborough airshows in the 1950's. 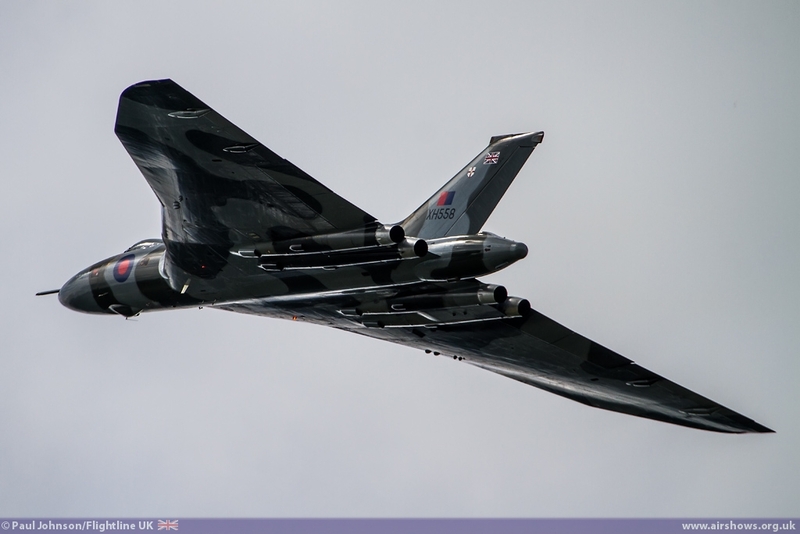 The same could also be said of the Canberra PR9 and the Vulcan B2 which offered a look at some of the heavier classic jets. 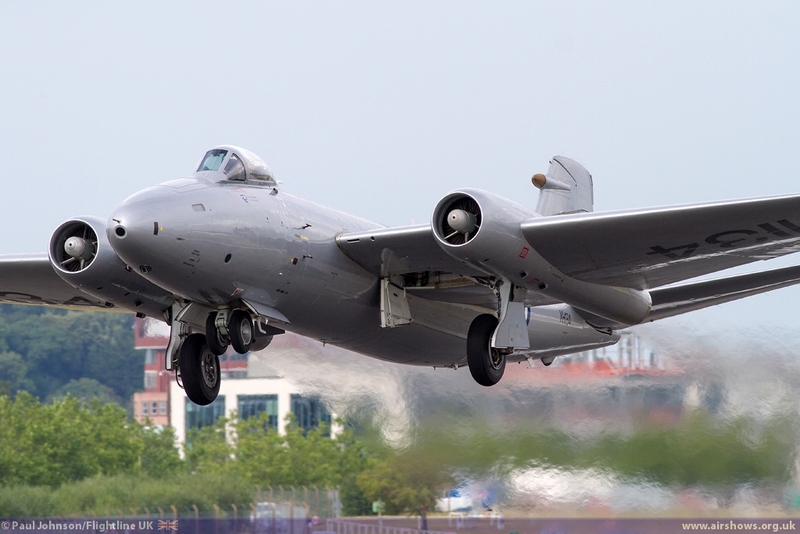 The Canberra PR9 from the Midair Squadron was something of a late but very welcome addition to the show representing a type that gained a superb reputation for its flying demonstrations at Farnborough. 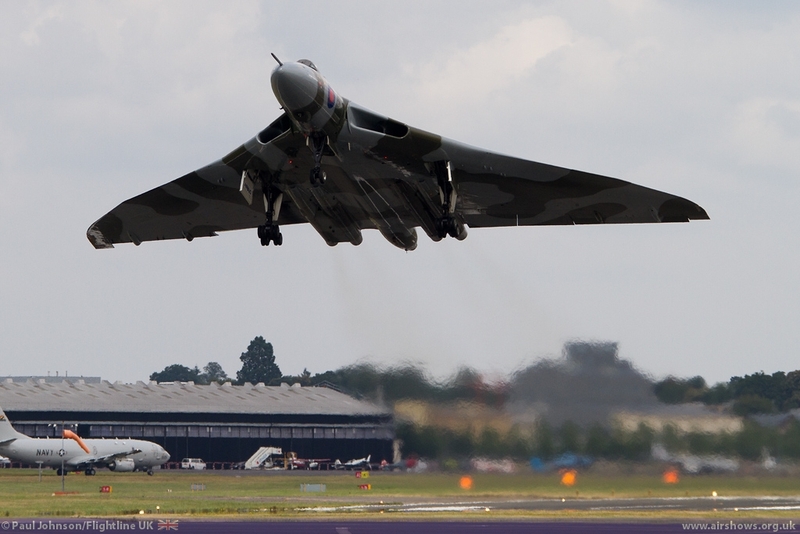 The Vulcan for many was a highlight of the show, certainly going by the results on the online Facebook poll! 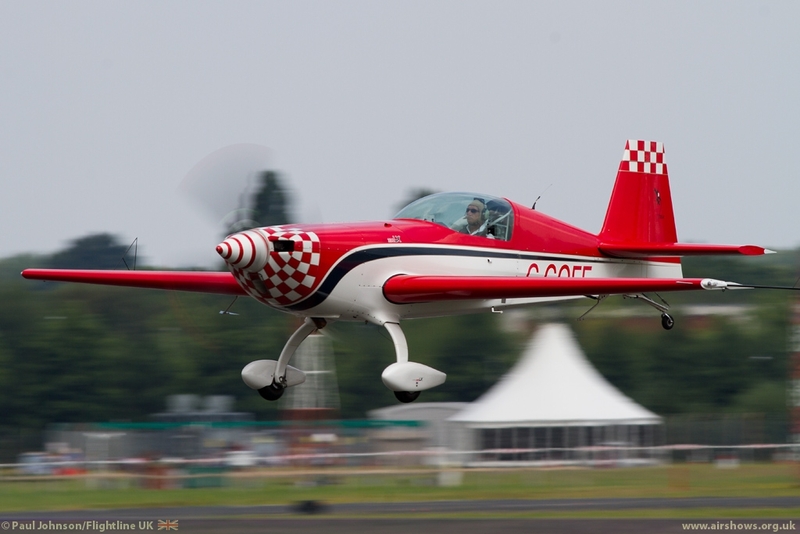 Certainly, Kev Rumen's take-offs over the public weekend will live long in memory for their ground-shaking drama! 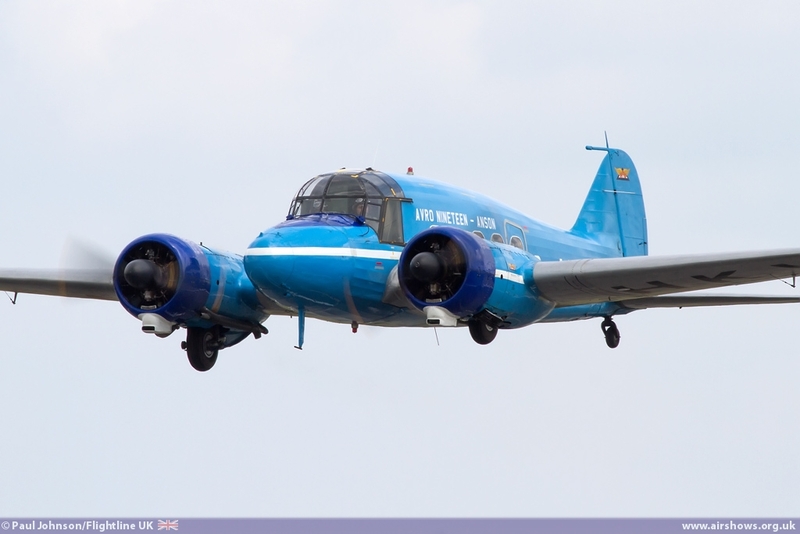 Representation from modern day flight could not have been more varied. 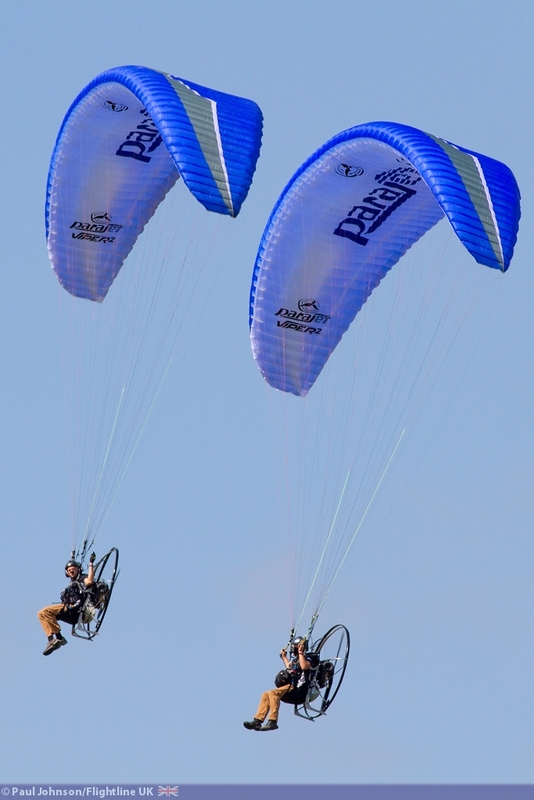 The Parajet duo of Paramotors stayed on from the trade week to provide one of the most unique displays of the afternoon. Paramotors are a very cheap and accessible way in the aviation currently being unregulated by the Civil Aviation Authority. 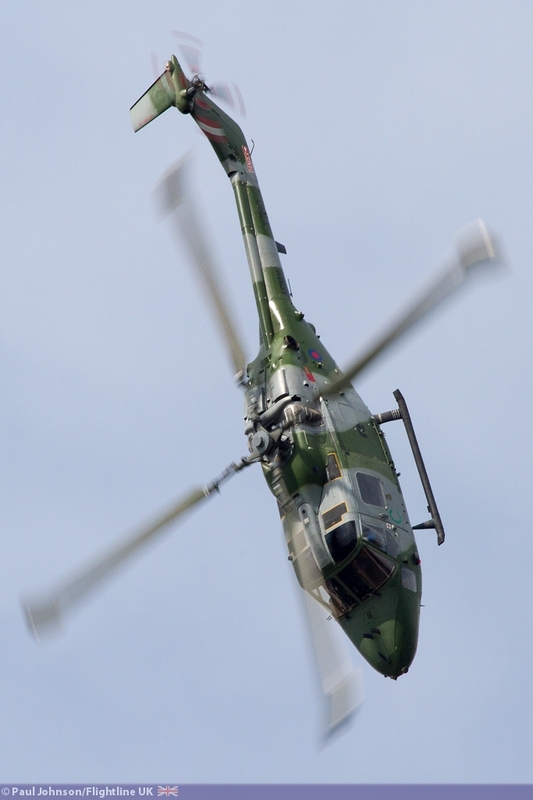 It also has to be said that Parajet's display was certainly very pleasing to watch with some very clever synchronised flying! 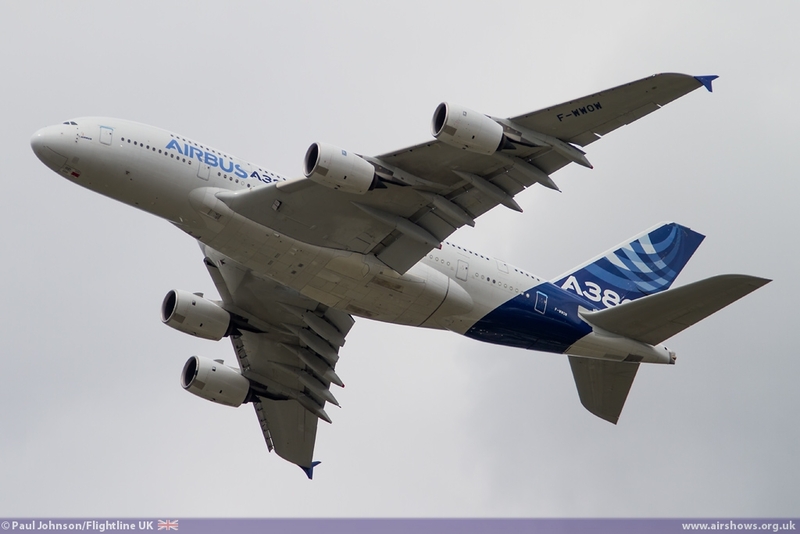 Commercial airliners are familiar to almost everyone. 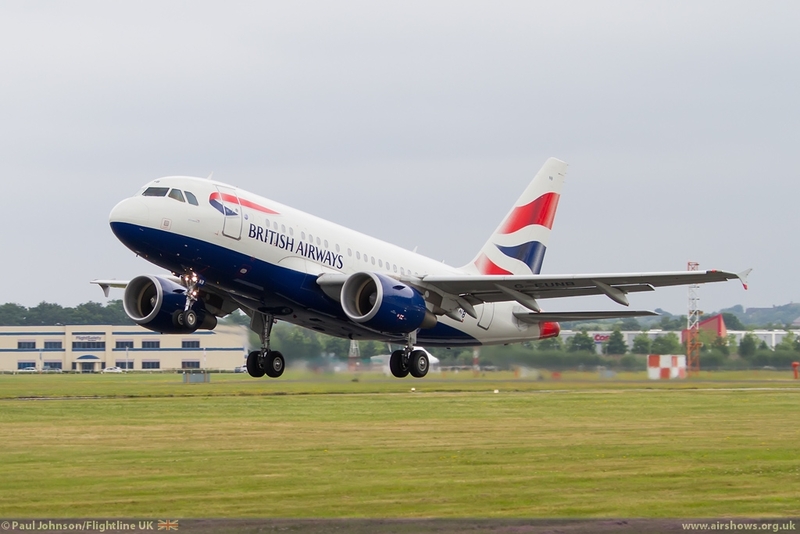 With the Boeing 787 and the A350 having left, it was left to the amazing Airbus A380 to display over the public weekend, though on the ground there was an Airbus A318 from British Airways. 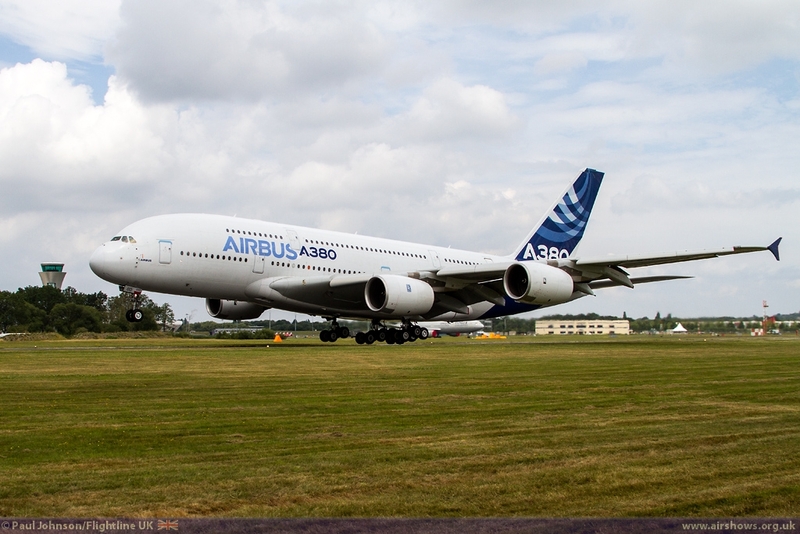 The A380 has been a highlight of Farnborough flying displays ever since it first appeared at the show and it is a big hit with the public crowds with it powerful, yet elegant routine. 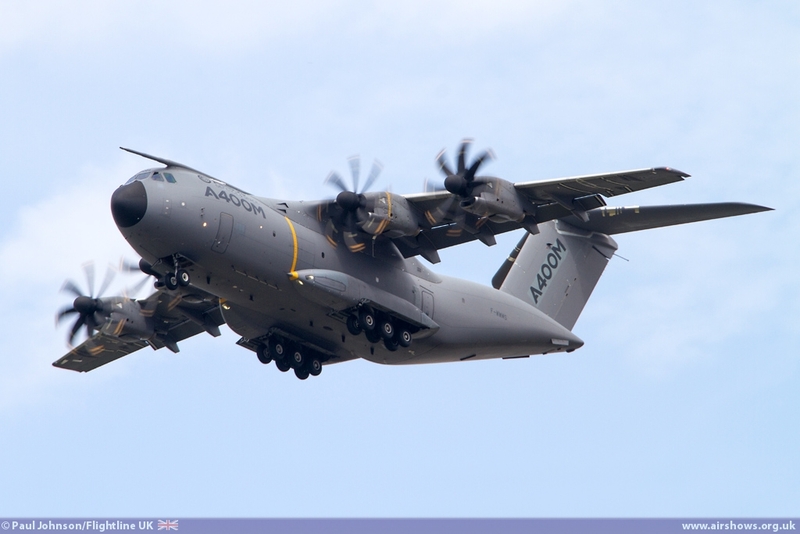 More "heavy" action also came from Airbus, though this time their Defence and Space division with the A400M Atlas. 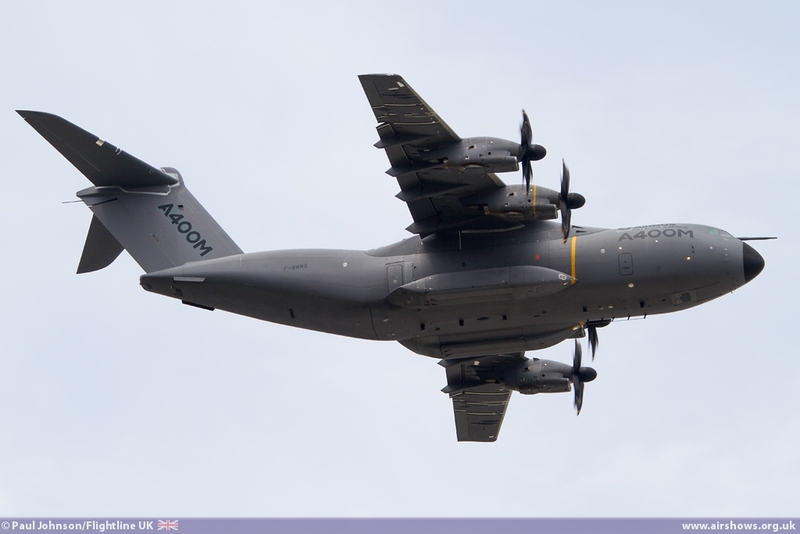 Flown by British test pilot Ed Strongman, the A400M routine is every bit as impressive as the A380 with steep slow climbs, some eye-watering dives and very tight turns! 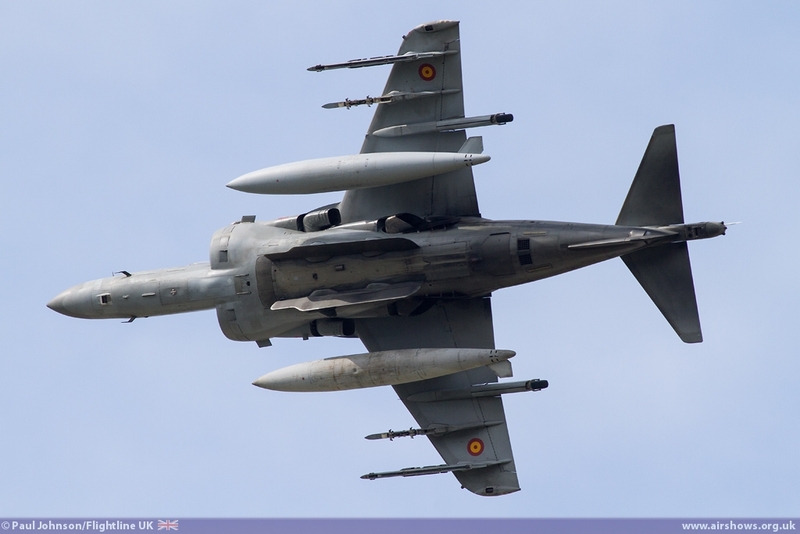 Continuing the modern military theme was the US Navy Boeing F/A-18F Super Hornet, another Farnborough favourite. 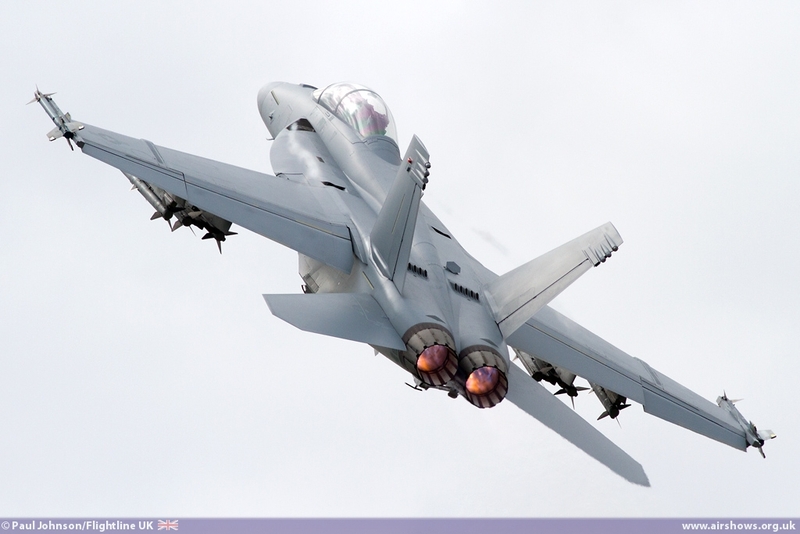 The Super Hornet is a very powerful fighter, and displays some quite amazing agility at slow and high speeds during its routine showing off the types care-free handling. 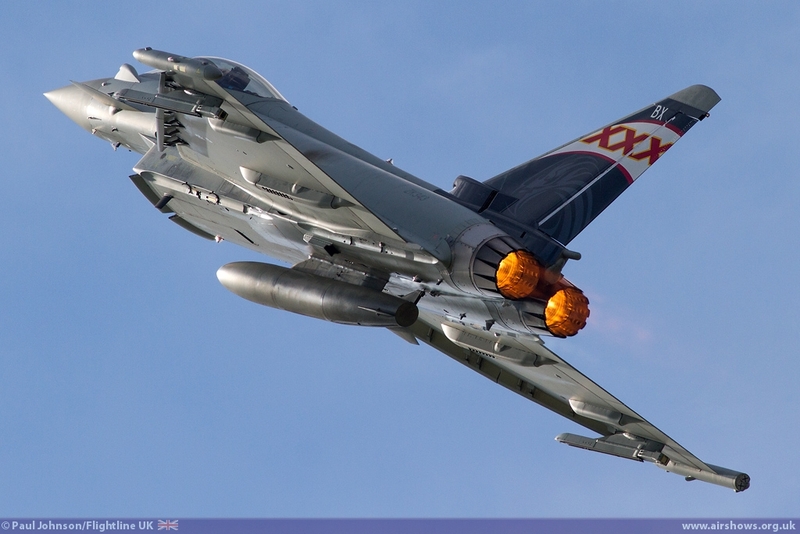 Further fast jet action came from the Royal Air Force with the Typhoon FGR4 flown by Flt Lt Noel Rees. 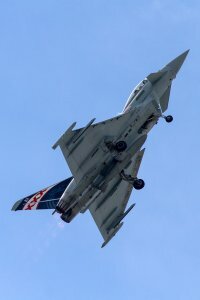 Noel's display at Farnborough looked particularly impressive and certainly represented the Eurofighter brand well throughout the week. 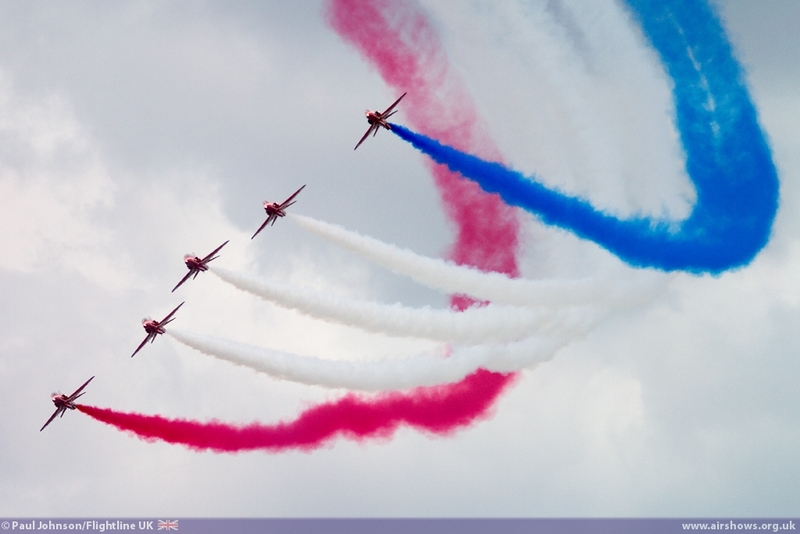 No Farnborough Airshow would be complete without the Red Arrows. 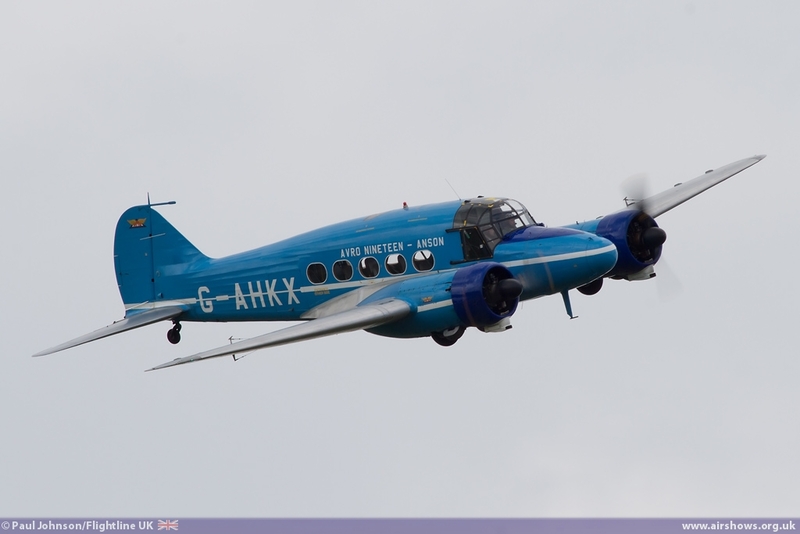 With the team celebrating their 50th Display Season this year, their Farnborough appearance was particularly special. 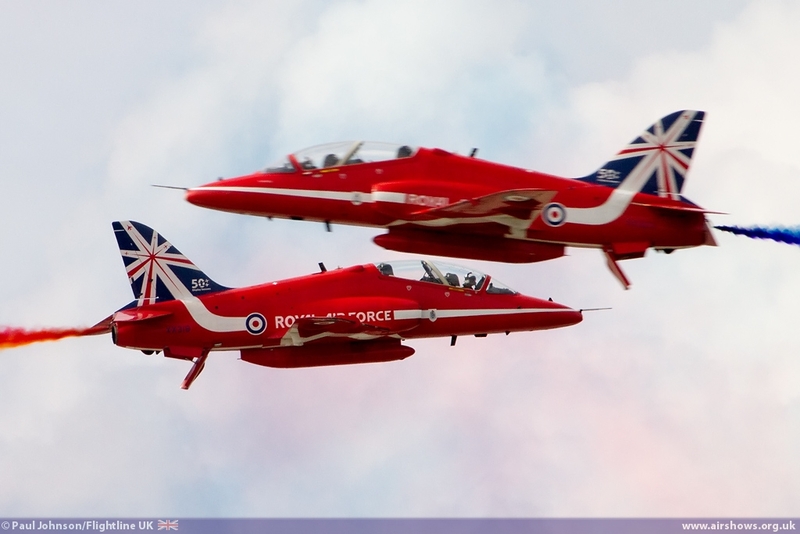 Despite forecasts, the weather was fine for all three of their performances resulting in three full displays over perhaps their most iconic display venue of the year. 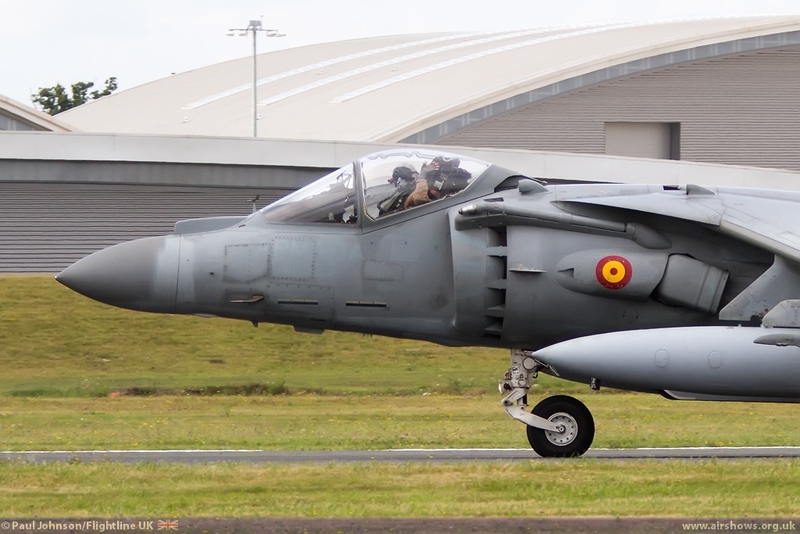 However, if there was one stand out act at Farnborough this year, it has to be the Spanish Navy McDonnell Douglas AV-8B+ Harrier II. 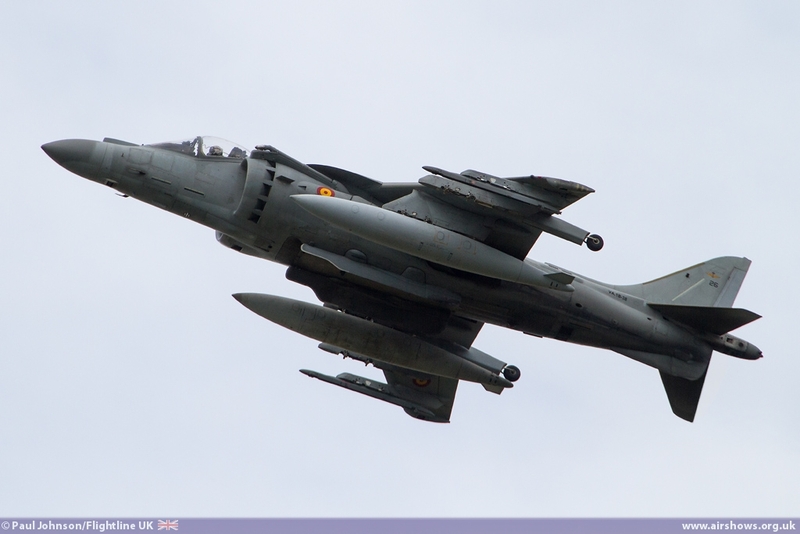 It may have not been the most dynamic routine, but the sight of the V/STOL jet back in UK skies hovering for the crowd was something to savour. 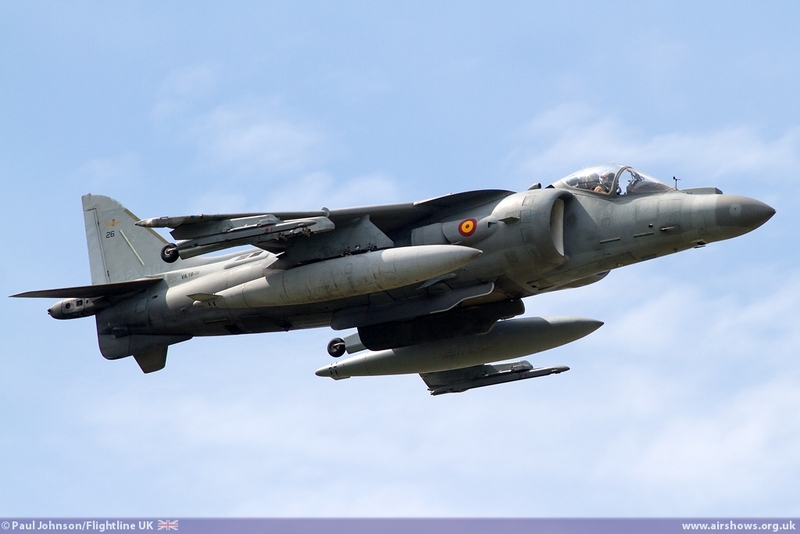 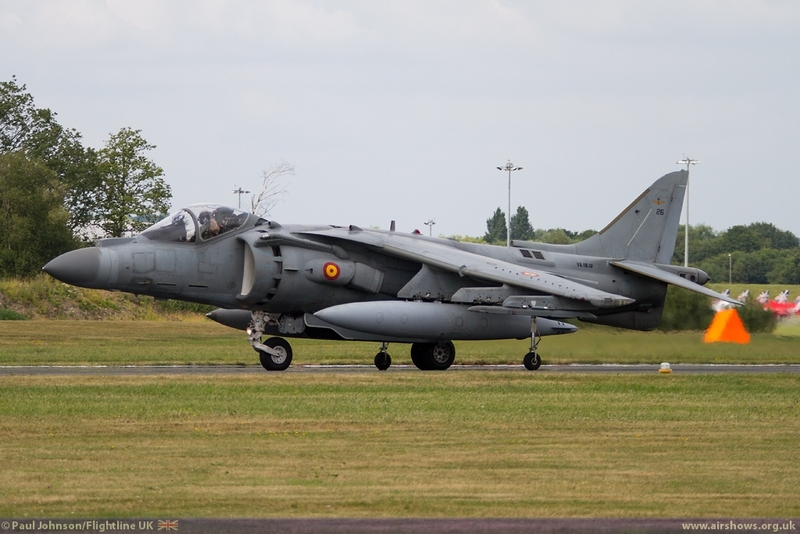 Negotiations with the Spanish Navy to get a Harrier to the show had been on-going for a year and a special role-demonstration was worked up just for Farnborough. 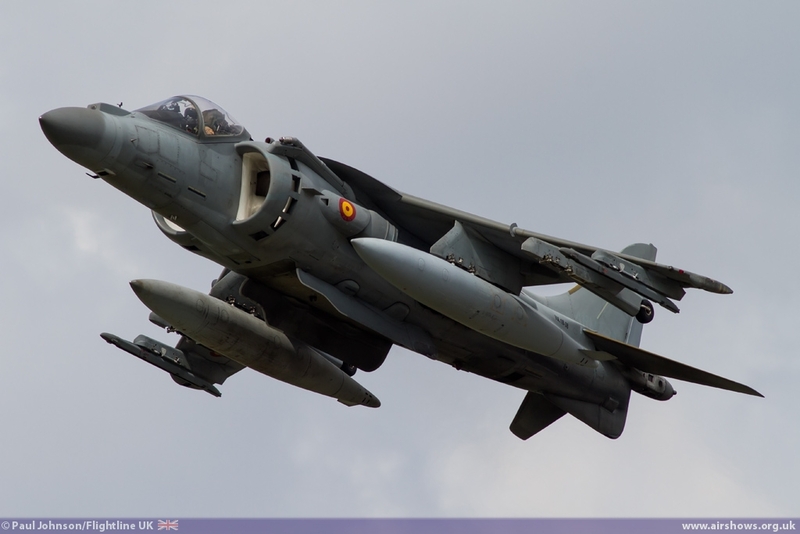 It was certainly very special and perhaps a little embarrassing for Lockheed Martin whose Harrier successor, the F-35B, was absent following a fleet wide grounding in the US! 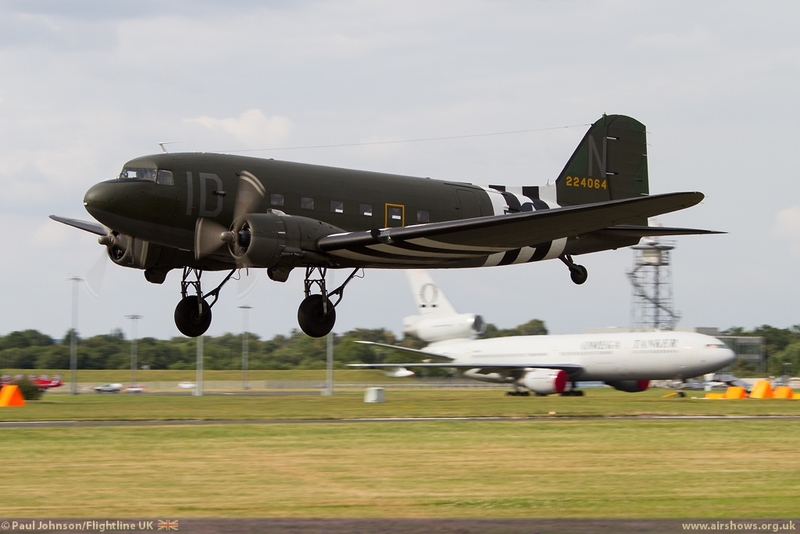 The Public Days were superb this year and certainly a great improvement on recent years. With the likes of the Harrier, Canberra, Vampire, Meteor, Vulcan and the Constellation in the flying programme, it was clear that Farnborough were trying to do something very special with the public days this year. 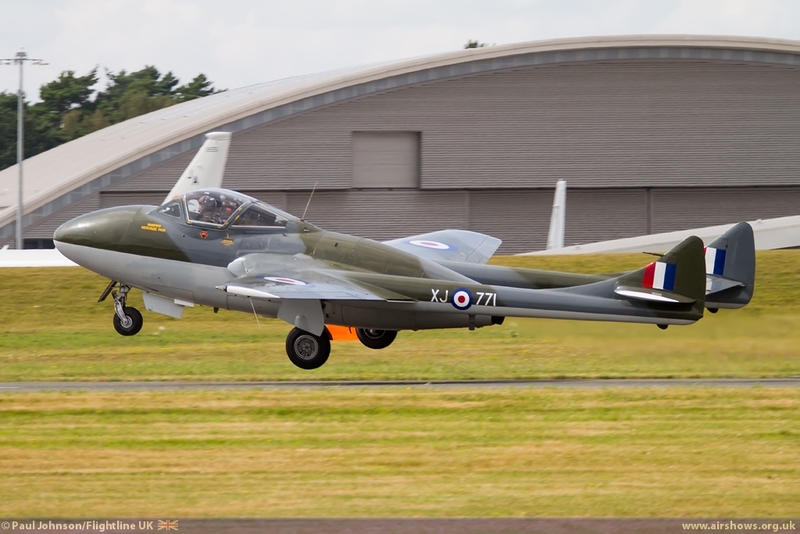 It is also worth mentioning that had it not been for unservicability, this year's show would have also included the UK display debut of a Messerschmitt Me262 replica from Germany which would have been outstanding. 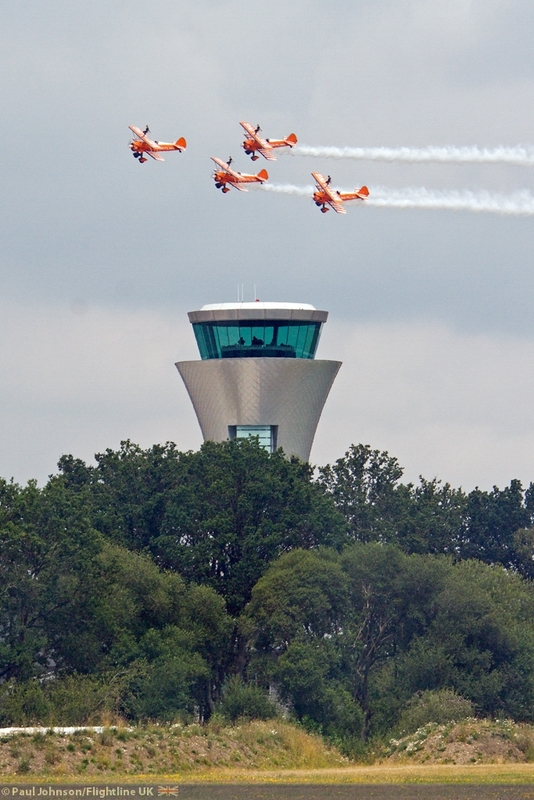 With the Farnborough Airshow admission commanding a premium price, we hope this level ambition shown by the organisers in respect to the aerial and ground entertainment continues and is bult on into 2016 and maintains Farnborough's special place on the airshow calendar.